DANGLES** 10K...$32 GP...$11 (Unless otherwise noted.) G. President, #001A H. Director of New Member Education, #0027 I. Emerald Chapter Member, #0106 (10K...$46 GP...$23) J. National Convention, #0042 K. Alumna/Graduating Senior (Anchored for Life), #0058 L. Scholarship Pearl, #0041 (Available in GP only.) M. Silhouette Rose Necklace, 18”, #SLD141 SS...$77 N. Barrel Bead Starter Bracelet, #BJ7295 SP...$5 O. Greek Letters Bead, #BEAD SS...$30 (Compatible with most popular bracelets.) P. Silhouette Rose Ring, #RD141 SS...$35 (Whole sizes only 5 – 9.) Q. Silhouette Rose Earrings, #ER141 SS...$43 R.	President	(Officer)	Ring, #0453 10K, 10W...$311 SS...$122 S. Simulated Pearl Toggle Bracelet with Engraved Tag, 7.5”, #636008T SS...$53 T. Graduation Stole, #STOLE...$30 *Badges must be ordered directly through HQ. **Visit www.HJGreek.com for the complete collection of dangles. K – karat gold, SS – sterling silver, GP – gold-plated Prices subject to change without notice. 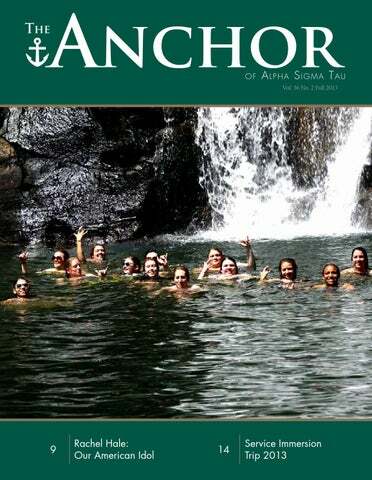 THE ANCHOR is the official magazine of Alpha Sigma Tau Sorority, and is published semiannually by the Alpha Sigma Tau National Sorority, 3334 Founders Road; Indianapolis, Indiana 46268 How to Receive THE ANCHOR Collegiate members receive THE ANCHOR through payment of their annual Sorority dues to their chapters. Copies are mailed to each undergraduate member’s permanent address as designated on her membership list submitted to National Headquarters. 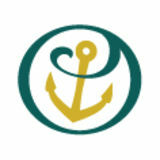 Alumnae members receive THE ANCHOR through payment of their annual alumnae dues to either National Headquarters or through their local alumnae association ($40 annually). How to Update Your Name and Address You may call (317) 613-7575 or e-mail us at headquarters@ alphasigmatau.org. If you prefer to submit your information via US mail, please complete the form on the National Homepage and mail it to: Alpha Sigma Tau National Headquarters, 3334 Founders Road; Indianapolis, IN 46268. How to Contact THE ANCHOR anchor@alphasigmatau.org www.alphasigmatau.org How to Send a Letter to the Editor Do you have a comment about an article in this or any other issue of THE ANCHOR? We want to hear from you! Letters to THE ANCHOR can be sent to the editor via email anchor@alphasigmatau.org; regular mail THE ANCHOR, 3334 Founders Road; Indianapolis, IN 46268; or fax (317) 613-7111). Please include your name, chapter, school and year of initiation. THE ANCHOR reserves the right to publish any letter addressed to the Editor and edit for space and clarity. A Note to Parents of Collegians Your daughter’s magazine is being mailed to her home address while she is in college. We hope you enjoy reading it, too. If your daughter is no longer in college or living at home, please send us her updated address, as indicated above. THE ANCHOR Staff Editor: Erika McManus Bukva, Delta Rho Associate Editor: Carole Bicking Keily, Alpha Xi Collegiate Editor: Beverly Singel Molnar, Delta Alumnae Editor: Kirsten Newman Heck, Gamma Pi Design Editor: Rachel Carlson, Beta Eta Photo Editor: Melanie Martin, Delta Eta On the Cover: Sisters in Hawaii during the 2013 Service Immersion Trip May 19-26, 2013. Basketball Star Honors Hometown Victims By Sally Brancheau Belknap, Alpha Riley Wurtz, Delta Phi (New York University), is from a place where nothing happens. At least, that is, until horror came to her hometown of Sandy Hook, Connecticut last December. According to Riley, Newtown and the village of Sandy Hook are as “small town” as you can get. Kids ride their bikes on the street, people visit the General Store in Newtown for sandwiches and, since there’s not much to do, people have to make their own fun. People know their neighbors. That changed December 14, 2012, when tragedy struck Sandy Hook Elementary School. A school shooting took the lives of 26 people, most of them children. Riley, away at NYU for her freshman year, couldn’t believe it. To her, it was unreal – things like this didn’t happen in Sandy Hook. Collegiate Chapters Transition to New Officer Structure By Justina Solties, Gamma Theta Member Engagement Coordinator In November 2013, all Alpha Sigma Tau collegiate chapters will begin using a new collegiate chapter officer structure. The new structure, which is primarily based on chapter size, utilizes teams and committees to engage the maximum number of members. With a heavier emphasis on collaboration than the previous officer structure, the new structure promotes the development of teamwork, responsibility, accountability, and engagement among collegians. Collegiate chapters, depending on their size, will transition into either the Crown Officer Structure, designed for chapters of 76 or more members; Pearl Officer Structure, designed for chapters of 31-75 members; or Anchor Officer Structure, designed for chapters of 30 or fewer members. The Crown, Pearl, and Anchor Officer Structures all include an Executive Committee consisting of a Chapter President, Vice President of Operations, Vice President of Finance, Vice President of Organization Development, Vice President of Member Development, Vice President of Growth, and Vice President of Community Relations. Each of the Executive Committee officers oversees a team of officers. For instance, the Vice President of Finance oversees the Finance Team. Also in the new officer structure are prescribed committees. Each chapter is expected to include the following committees: Nominations Committee, Bylaws Revision Committee, Budget Committee, Recruitment Committee, Risk Reduction Committee, Philanthropy Committee, and New Member Education Committee. The committee-based portion of the new collegiate chapter officer structure is intended to enhance leadership skills in chapter officers, reduce chapter officer burnout, and increase member engagement. The new collegiate chapter officer structure was introduced in June 2013 at both Advisor Academy and Officer Academy, and many members, both collegiate and alumnae, are already looking forward to the transition. Following the structure’s introduction to collegiate officers at Officer Academy, collegians provided their feedback on the change. “I am very excited for this new structure,” said a collegiate officer. “It should help with communication and organization.” “Based on experience in both a higher chapter size when a collegian and now a smaller size as an advisor, I think this is a GREAT idea and am looking forward to the transition,” stated a Chapter Advisory Board member. “I really think it’s going to take the stress off smaller groups that may feel like they’re drowning and keep larger groups’ members active and involved!” Each stage of the creation and implementation of the new collegiate chapter officer structure included feedback from members. The decision to transition to a new structure was based on survey results from collegiate and Chapter Advisory Board members. Additionally, after introducing the new officer structure to collegians at Officer Academy, slight adjustments were made in the structure to best meet members’ needs. To ensure a smooth transition for collegiate chapters, Alpha Sigma Tau National Headquarters staff members are providing ongoing education to chapters through live webinars, accessible resources, and individualized attention. For questions regarding the new collegiate chapter officer structure, please call Alpha Sigma Tau National Headquarters at 317-613-7575 or email admin@alphasigmatau.org. for The National Foundation With the recent move to Indianapolis and changes to our Board structure (more information on this change soon), the Alpha Sigma Tau Foundation decided to change its look.The Foundation chose Willow Marketing in Indianapolis to help us with this change. Several Board members joined with our team at Willow on a conference call to provide background information and ideas for the new logo. The discussion started with the Sorority’s contemporary logo and how the Foundation’s new look could complement it. We also discussed the symbols of ΑΣΤ – specifically, the anchor and the rose. While in Indianapolis in August, the Willow team presented the Foundation Executive Committee with three concepts for its new look. All three of these concepts were well thought out and well designed based on the information given in our conference call. The Executive Committee discussed and evaluated all of the concepts. As we were meeting at Headquarters, we asked the ΑΣΤ Headquarters team members to join us for reactions and feedback. The response was unanimous and the Foundation is pleased to present our new logo on our suite of marketing materials. This suite of materials includes letterhead, envelopes, thank you cards, and business cards. In an effort enhance the collegiate member experience and provide more support to chapter advisors, Alpha Sigma Tau hosted Advisor Academy, the Sorority’s first academy exclusive to Chapter Advisory Board members. Advisory Academy 2013 was held in Schaumburg, Illinois, June 7-9, 2013; approximately 30 Chapter Advisory Board members participated in the event. The programming at Advisor Academy didn’t focus on the operational side of Sorority life, such as reports, events, budgets, or even officer positions. Instead, Advisor Academy focused on providing advisors the tools and knowledge they need to work with today’s college students and as a member of a Chapter Advisory Board team. The weekend also provided the opportunity for advisors from chapters across the country to connect with one another and share ideas. Sessions were led by Executive Director Jim Paponetti and other Headquarters staff, and by Michelle Marchand, Director of Educational Programs, Delta Upsilon International Fraternity. The educational programming began on Saturday with Decoding Generational Differences, a session devoted to helping chapter advisors understand the characteristics of millennials and discover better ways to communicate with them. The next session, Dysfunctional Teams, focused on helping advisors achieve a cohesive Chapter Advisory Board. Because working as a member of a Chapter Advisory Board is a team effort, the attendees learned about the qualities of both functional and dysfunctional teams and how to navigate some dysfunctions with their Chapter Advisory Board. In the afternoon, the attendees participated in Coaching vs. Managing, a program intended to educate advisors on the difference between coaching and managing the chapter. The advisors learned different techniques on how to empower, coach, and mentor the collegians, rather than try to manage their behaviors and actions. Keep Calm and Empower Change taught advisors how to identify opportunities to empower positive change within the chapter. Advisor Academy educational programming concluded with Creating Your Game Plan, a session devoted to providing the participants with the opportunity to develop a game plan of putting their new knowledge into action. National Vice Presidents Tiffany Street and Kristin Walker, and Kris Haskin, Vice President of the Alpha Sigma Tau National Foundation, attended the weekend’s events and connected with the individuals who work so closely with the Sorority’s collegiate chapters. The current structure for the Alpha Sigma Tau Chapter Advisory Board consists of six positions: Chapter Advisor, Assistant Chapter Advisor, Recruitment Advisor, New Member Advisor, Chapter Consultant, and Faculty Advisor; all Chapter Advisory Board members were invited and encouraged to attend Advisor Academy. Based on the positive feedback regarding the event, the Sorority plans to host another advisor-focused educational event in 2014. If you are interested in sharing your passion for the Sorority by mentoring and empowering young women and helping them have a positive collegiate experience, please consider applying to become a member of a Chapter Advisory Board. Visit http://alphasigmatau.org/ alumnae/volunteer/ or call Kellee Neary, Chapter Services Specialist, at 317-613-7564 for more information. As a small child in Prescott, Ark., Rachel Hale was so shy that she would only talk to her parents; she wouldn’t even talk to her grandparents, aunts, or uncles. Rachel’s career as a singer began in a preschool musical when she walked past the other children on her way to be front and center on the stage, and her shyness disappeared almost overnight. “I would talk to my family, but I would not sit in their laps, and I was never the full version of myself. I would communicate though, just not a lot,” said Rachel. Rachel started voice lessons at age 10, and at 13, she won the title of Pre-Teen America. As Pre-Teen America, Rachel traveled across the United States singing and speaking to hundreds of girls at state conventions. In high school, Rachel entertained at various festivals, fundraisers, telethons, and political rallies across Southwest Arkansas and East Texas. She competed and won the opportunity to open for country star Tracy Byrd and the following year, she opened for Joe Nichols. She got her first guitar when she was 16. She laughed as she recalled, “My parents said it would take me further than a car ever could, and they were right.” Rachel is in her final semester at Belmont University in Nashville, Tennessee, majoring in Songwriting with a minor in Music Business. In addition to Alpha Sigma Tau-Delta Eta Chapter, she is a member of the Student Government Association’s congress, Service Corps, Belmont University Songwriter’s Association, and Belmont’s Women’s Choir. While at Belmont, Rachel has entertained for Belmont’s 2009 Mistletoe Ball and was seen in the nationally-televised Christmas at Belmont in 2009. In 2012, Rachel was asked to perform an original song at Belmont’s “Homecoming in the Round” Concert, sharing the stage with a number of music celebrities. While interning in Los Angeles for Patriot Records in June 2012, Rachel auditioned for Season 12 of American Idol. “It’s definitely a big cattle-call crowd. American Idol allowed online auditions this year, so a lot more people auditioned than the just the crowds you saw on TV.” Rachel had three auditions before the celebrity judges, about three months apart, beginning in the summer of 2012; the segments aired beginning in February 2013.
with Alli this past summer at Officer Academy, it was interesting to hear her perspective on the collegiate role on National Council. She worked to emphasize the level of responsibility, commitment, and enjoyment she had received from the position. The role on our National Council was not exactly what Alli had expected, but since she was the first to take the position, there was no person or history to reference. It was a wonderful learning experience that helped her develop her leadership voice and gave her opportunities that she will cherish. The conference calls, reading, preparation, deadlines, and some travel helped her learn to manage her time carefully, but she also had wonderful experiences like installing a new chapter and speaking with members from all over the country. It is exciting to think that another collegiate woman will get the opportunity to serve on our National Council every two years. It is a unique chance to serve on a strategic board, build leadership skills, and work at the highest level of a national organization. The Nominations Committee is currently taking applications for National Council slate and will do so until January 15, 2014. The slate will be announced by March 1, 2014. Sisters who submit an application before January 15 will be interviewed and her references will be checked. Any candidate in good standing who applies after the January15 deadline will have the option of running from the floor at Convention. After the slate is announced in March, nominations from the floor will proceed until seven days before the opening of convention (June 19, 2014). The process of running for National Council continues during Convention, as each candidate (slated or not) is expected to make a speech of no more than three minutes. Any sister interested in running for National Council should keep in mind the key dates and check www.alphasigmatau. org for updates. Questions can be directed to nominations@alphasigmatau.org. Ability to recognize challenges and opportunities both in and outside of Alpha Sigma Tau, noting and evaluating progress and struggles of similar organizations, as well as having a finger on the pulse of innovation and searching for what could possibly best fit our organization. Using internal organization reflection and evaluation in order to cultivate nimble response to current and future needs. Strategic thinkers question the current status quo and their own personal assumptions. Strategic thinkers are able to look at issues from multiple points of view (seeking divergent thoughts and perspectives) in addition to the root causes (not just symptoms) ofproblems. This involves a strong developed sense of patience, courage, and open mindedness. Analysis of all information inputs and the ability to synthesize everything in order to recognize patterns, see the small and big picture. Evaluating whether there are missing parts and seeking new insights allows for testing and debating many options before coming to a conclusion. Develop multiple options, with short and long term goals in mind, through a methodical approach that balances rigor with speed. Once consensus is made, the leaders must have the courage of their convictions, unified support of the decision on all levels, and know that fidelity to the process brings the best possible outcome for Alpha Sigma Tau. Using proactive communication, trust building, and frequent engagement to create common ground and buy-in from the entire membership and stakeholders. When decisions have been made and are in implementation, reach directly out to those with opposing views to understand their concerns and address them. Be the focal point for organizational learning, promoting a culture of inquiry, evaluating lessons learned from successes and failures. This is done by sharing knowledge gained through conferences, reading, growing in oneâ&#x20AC;&#x2122;s personal or professional life in a systematic fashion. As a strategic leader, becoming the public face of Alpha Sigma Tau means a sister must have a high capacity to develop and maintain effective relationships with others (both within and outside our membership). This is the most pivotal aspect for cultivating strategic leadership. There must be an understanding of conflict through healthy discussion and resolution. The candidate must have the ability to reach out, work to understand other viewpoints, ask the tough questions, and have a respectful space for the exchange of supporting and opposing ideas, understanding that all this will produce superior results. On Friday, April 19, 2013, just a few days after the Boston Marathon bombings, the University of Massachusetts Dartmouth declared an evacuation of the school as police searched for the alleged bombers, who authorities believed they may have placed a bomb on campus. Among those evacuated were members of the Alpha Sigma Tau Gamma Delta chapter. As Boston and the surrounding towns were on lockdown as the manhunt was underway, Gamma Delta sisters quickly packed up their bags and headed out of town, not knowing how long they’d be gone. According to Emily Starvaski, Gamma Delta Chapter President, the campus evacuated as smoothly as it could have been based on the nature of the situation. News trucks, police officers, and Blackhawk helicopters made their presence on campus as the Gamma Delta hapter members fled. Sydney Bouchard, Gamma Delta member, opened her doors to 12 chapter members, Emily included, who needed a place to go. Her small third floor apartment in New Bedford, Mass. had little food and no cable television to watch the news unfold. Emily contacted every chapter member by text and Facebook to make sure they were safe and had a place to go, and thankfully they all did. “Everyone who lived in the area offered their home as a place to stay, and it did not matter who or how many were coming to stay,” said Emily. While at Sydney’s, the chapter members saw picture of the school through social media outlets. “It was unbelievable to see our school, the place where we call home, the place where we have grown as people, and the place where we all became sisters, under such distress and utter madness,” said Emily. Gamma Delta members took part in the Torch Relay for the One Fund. Alyssa Sahr is sure that there are few things more exciting than getting a call from an Alpha Sigma Tau National Vice President to congratulate you on being chosen to represent Alpha Sigma Tau at the Fraternal Government Relations Coalition (FGRC) Student Congressional Visits. After the excitement comes the important decision: can I take a whole week off of school to travel to our nation’s capital to lobby Congress? After discussions with professors and teammates, the answer was a resounding “yes!” Each year, the FGRC gathers Greek alumni and undergraduate leaders to learn about legislative efforts supporting Greek life. The participants spend two days in training about Washington D.C., the Fraternity and Sorority Political Action Committee (FSPAC), and the legislation that they are looking to have included in the current tax reform efforts going on in the House and the Senate. This includes facts, figures, and statistics to rally backing for the Collegiate Housing and Infrastructure Act, or CHIA, which would improve the condition and safety of student housing facilities, including those owned by fraternities and sororities. Specifically, the bill would allow taxdeductible charitable contributions made to fraternity and sorority educational foundations to be used for infrastructure improvements and the installation of fire detection and prevention systems in local not-for-profit student housing. On day three, the participants meet face-to-face with Members of Congress to enlist their support for the legislation. This year, Alpha Sigma Tau was represented by Alyssa, from the Beta Xi Chapter at Michigan Technological University, and Emily Starvaski, of the Gamma Delta Chapter at the University of Massachusetts Dartmouth. Along with the collegiate representatives, many National and International Presidents, staff, and alumni of various Greek organizations join the effort. Have you wondered what about the meaning of some of the words you hear in the Panhellenic community on your campus or when speaking with national volunteers? Here is what you need to know: ■■ Quota The number of women that may be pledged during fully structured recruitment, partially structured recruitment or minimally structured recruitment. ■■ Total The maximum allowable size of a chapter, determined by the College Panhellenic; includes both new members and initiated members. ■■ Unanimous Agreement Agreements that all 26 NPC member groups have unanimously approved and agreed to enforce. The agreements are binding on all NPC groups. ■■ Positive Panhellenic Contact Normal Friendly Contact Used to promote participation in Greek Life on campus and not to promote an individual sorority/fraternity. Any discussion of recruitment of a general and Panhellenic nature is usually acceptable. ■■ Silence Strict Silence Observed only between the end of preference events and extension of bids. As always, if you ever have any questions, please do not hesitate to contact your chapter’s assigned Alpha Sigma Tau NPC Delegate either by phone or email. Your assigned ΑΣΤ NPC Delegation member can be found in Officer Portal. the culture and customs of their organization. I networked as a Psychology major and hopefully made some worthy connections. And most importantly I learned to come out of my shell and put myself out there on Capitol Hill with the support of my Sorority behind me.” Alyssa agrees that “seeing the democratic process in action from the inside was an amazing experience that would not have been possible without the hard work and organization of the FSPAC. It was an honor to be selected to represent Alpha Sigma Tau in Congress and with our fellow brothers and sisters.” To learn more about CHIA and the FGRC, go to www.fgrc.com. made personal self-discoveries. The service immersion experience began with a nontraditional icebreaker – a double-decker ropes course emphasizing teamwork and overcoming fear. In addition to tirelessly volunteering during the day, the women participated in leadership development curriculum each night. The topics consisted of personal values and authentic confidence in women, the value of validation and its importance for leaders, as well as confrontation and conflict management. Additionally, they created and shared their personal vision boards of who they see themselves as, and who they want to be. Service and leadership training were not the only things on the agenda. Sisters spent an afternoon at the Polynesian Culture Center learning about the Polynesian islands. After a week of working hard, the women had a free day in Waikiki. They spent time together on the beach, went shopping, and took paddle boarding lessons before having a final group dinner. The sisters who began the experience as strangers grew incredibly close throughout the week. Through their shared experiences of service and personal development, they experienced firsthand the limitless possibilities of the Alpha Sigma Tau Sisterhood. Alpha Sigma Tau is planning another Service Immersion experience and details will be announced when the timeline is finalized. in our community.” Nadia Maddens, another alumna from the Theta Chapter, adds that “doing service projects hands on, as a group, is a good way to get to know people better. It’s amazing how much we can accomplish when we work together.” Jenny Ignatowski, a Delta Tau alumna, says “I’ve been able to participate as a collegian and as an alumna. I’m so glad this has become a tradition!” Each year, sisters try to beat the number of boxes packed the previous year. In 2011, sisters packed 850 boxes. In 2012, sisters packed 1,000 boxes. This year, the two chapters collectively packed 1,100 boxes and even made the assembly line stay open longer so the pallet could be finished! Nicole Kogowski, a collegian from Delta Tau, says, “I like trying to beat our record from the previous year because it shows that we are there to try to make a difference in someone else’s life by trying to pack as many boxes of food as we can.” All the sisters who participated said they would love to do it again, and that’s the plan! Reservations for spring 2014 have already been made and we’ve warned the people at the factory: Have lots of boxes prepared and the assembly line ready – we’re coming back to beat our record! This ΑΣΤ wants you to take control of your financial life – but she’s not going to tell you to cut up your credit cards. make those lifestyle changes unless you really believe that it’s better for you.” Saving money for exciting things like travel or being debt free makes the short-term sacrifices worth it and helps alleviate the boredom you may feel about managing your money. This is Levison’s first book. It was released in July 2013 and she is excited to see where it leads. Her advice is to persevere: it took “a few years” to reach this goal and she considered giving up multiple times! She also counsels becoming involved in professional organizations in order to recognize the value of volunteering for professional development. Get your copy of Frugal Isn’t Cheap: Spend Less, Save More, and Live Better at Amazon! Caroline Shaw, Beta Phi, an IT Specialist for the Army Reserves, speaks to us about her journey, the similarities between the military and sorority life, and how sisters can best support the military. Caroline also talks about serving our country, growing in your career and finding a job you are passionate about –all at the same time. ALUMNAE BALTIMORE As we approach our third anniversary as an alumnae chapter, our group continues to grow and mature. We are thrilled to share our lives with friends, and these sisters who are more than friends. Our March luncheon at the new home of Nazie Spurrier, Beta Mu, was filled with laughter and good food. We collected over 1,000 diapers for My Sister’s Place, a shelter for women and children in downtown Baltimore. In May, we supported the Robert Packard Center for ALS Research in their 7th Annual Fiesta 5K. Treasurer Kirsten Heck, Gamma Pi, is a development officer with the Center. We were thrilled to name dedicated member Joell Sperry, Gamma Theta, as the 2013 Baltimore Top Tau. Joell’s resolution this year is to attend every alumnae event, and we couldn’t be happier to have her. Pam Emory, Beta Mu, invited our families back to her home for a pool party and BBQ in August, and we were blessed with wonderful weather and a great turnout. In September, we returned to Little Havana for brunch and were so glad to welcome newcomer Surraya Khan, Delta Delta. Looking ahead, our chapter is excited to celebrate Oktoberfest with a beer tasting hosted by Diane Raycob, Psi. We will observe Founders Day at the home of Debi Meeks, Beta Mu, and finish off the year with our annual Cookie Exchange, hosted by Tina Tiley, Zeta. Are you living in Charm City and looking to get involved? We’re very social, and we’d love to meet you! Email us at baltimorealumnae@ gmail.com or find us on Facebook! BALTIMORE Marathon in honor of the Boston Police. This particular half marathon focused on the first responders from the April marathon bombings. Athena Mota, Gamma Delta, is entering her second semester as the Gamma Delta Chapter Advisor. She was honored with the collegiate chapter’s first annual alumnae award, the 2013 Anchor Award. She attended Advisor Academy in June along with the Gamma Delta Recruitment Advisor, Michelle Macey, Gamma Delta. Athena also is an advocate for the March of Dimes and participates in the annual March for Babies as her own children, Dominic and Sophia, were born prematurely. Congratulations, ladies, on your accomplishments! Since fundraising is our primary focus at this time, we continue to sell tote bags that can be used for books, for the beach or for groceries. These totes are silk-screened with our statement of sisterhood, “alpha sigma tau: forging friendships forever,” and can be ordered by contacting Yolanda Bauer at yolanda.bauer@verizon.net. If you are living in the Boston area, or plan to visit, and would like to join our meetings or our social gatherings, we invite you to join us! We recently welcomed three new arrivals to the Boston area – women who relocated for either graduate school or for their jobs. We are also eager to reconnect with women who arrived in our city over the past two years. Boston is a town that continually attracts newcomers! Buffalo Our Buffalo Alumnae Chapter had a fun-filled spring, beginning with our January luncheon meeting held at Rizzoto’s Restaurant. We had a great time sharing post-holiday news at the event hosted by Michele Luppino, Susan McNamara, Pamela Wales Szafarczyk and Maria Dispenza Lagona. As a philanthropy project, we collected women’s toiletries for Vive’ la Casa, a local refugee shelter. Cassandra Pershyn hosted February’s business meeting at Friendly’s Restaurant. Her co-hostess was Dolores Crapsi Schmidt. Catherine Kieffer Gervase supplied our customary candy, nuts and door prizes. Rachel Binda Lis was surprised to find that our meeting was also her baby shower! She has since given birth to a beautiful little girl, Marinella Sophia. During the evening, we also assembled goody bags for members of our local Sigma and Epsilon Mu collegiate chapters. Our annual Pound Auction always generates much anticipation. This March, the event was held in the home of Susan McNamara. Each attendee brought an item weighing a pound to be auctioned off as a fundraiser. Sue was assisted by Holly LaBrake Ndeze and Michele Luppino. We don’t usually have a business meeting in April yet the month is always busy. President Nicole Moretta Ball, along with members of the Sigma chapter traveled to Geneseo, New York to attend the installation of Epsilon Rho Chapter. Both Nicole and our Sigma sisters were honored to play key roles in the Ritual. The next day, we attended the Greater Buffalo Alumnae Panhellenic Scholarship fundraiser at the Paddock Golfdome. The Buffalo Alumnae were well represented and we had a great time playing miniature golf under the dome. We returned to Friendly’s Restaurant for a fundraiser in April. For anyone who brought the designated voucher, the restaurant supplied a portion of the meal cost to our chapter. Family members, co-workers and the public also had an opportunity to participate in our Basket Raffle with prizes donated by our members. We offered a discount to members of Sigma and Epsilon Mu, and were pleased with the turnout from our local collegiate sisters. Nicole Ball and her committee deemed the event a great success, and plans are in the works for an encore this fall. In early May, seven alumnae members and Kristine Assue from the Sigma chapter assisted the Junior League with their biennial Decorator Showhouse. After completing our docent responsibilities, we enjoyed lunch in the quaint village of East Aurora. We welcomed five new members into the Buffalo Alumnae Chapter in May. Our newest sisters represent both Epsilon Mu and Sigma. A dessert meeting was held at the Bellevue hotel, hosted by Nicole Ball and Rachel Lis with assistance from Sally Strum Wales and Elizabeth Syposs Maerten. Sigma’s Assistant Chapter Advisor Nicole Ball was able to attend Advisor Academy held June 7-9. She said it was a very worthwhile experience and had lots of information to share with the advisory team upon her return. ERIE Last year’s wine tour was so popular that Sue McNamara arranged for our members and guests to tour the Niagara Wine Trail again in lieu of our usual June Mystery Trip. In addition to visiting several wineries, everyone enjoyed lunch at the Wilson Boat House near Lake Ontario. Our chapter has been busy over the past months. In February we held a Claytopia fundraising event where we painted anchor boxes and other items. We joined the Alpha Tau collegians in April to volunteer at Second Harvest Foodbank, and packed several hundred food boxes for senior citizens. In May, we held our annual meeting and election of officers. We remained active into the summer months. Three of us participated in the Highmark Walk for a Healthy Community on June 8th at Presque Isle State Park. Juliann Zawadzki even brought her dogs, Hank & Hurley! Together, we raised $150.00 for Habitat for Humanity. In August, sisters went on a tour of four local wineries in North East, PA. We volunteered at the food bank again on the afternoon of August 17th, after supporting Juliann at her half-marathon race in the morning. On September 29th we celebrated our chapter’s third anniversary with a Sunday brunch at Pufferbelly Restaurant. Looking ahead, we’re excited to celebrate Founders Day at the Stonehouse Inn Tea Room. Our new philanthropy project is AdoptA-Highway on a 2-mile stretch of Interstate 79 between the Kearsarge exit and the I-90 interchange. This is adjacent to the Delta Alpha Chapter’s area to the north, so our name will be getting more visibility. Our new e-mail address is asteriealum@gmail.com and our Twitter account is @AST_ErieAlum. We’re always looking for new members, so please contact us. ALUMNAE alumnae chapter. We held an ice cream social and a Pet Shower to collect donations of cash and supplies for the Michigan Anti-Cruelty Society. The summer is a busy time for all of us, but we do get together in July and have a night out with just our sisters. In September we will resume our regular meeting schedule. For more information on our chapter, please contact Lauren Bendes Warren at labendes@mtu.edu. After taking the summer off, sisters gathered in August for our Annual BBQ and to plan our calendar of events for 2013 and 2014. After catching up and eating some great burgers, we started planning the year with our first event in September – a brewery tour. In October, our chapter will be heading to Feed My Starving Children, a nonprofit Christian organization committed to feeding God’s children, both in body and spirit. The approach is simple: children and adults hand-pack meals specifically formulated for malnourished children, and we ship the meals to nearly 70 countries around the world. In December, we will continue with a favorite event, the Holiday Party. We all bring gifts for an exchange that can get quite intense at times. The gifts go into the circle and everyone gets a number. After the first person picks a gift and opens it, the second person can choose a new gift or steal the first person’s gift, and so on. No one is safe from a steal! We will re-group in February for another favorite: fondue. We always enjoy both cheese and chocolate fondues, with a variety of goodies for dipping. At this meeting, we start to discuss Convention activities and any potential bylaw revisions. In April, sisters will celebrate our 18th Local Founders Day with dinner at La Tasca, a great local tapas restaurant. We share stories about our experiences with Alpha Sigma Tau and enjoy the sisterhood time. At this meeting, we will share Convention updates. Several sisters are already planning a road trip to Atlanta for the 40th National Convention. We will finish off the year by starting over again – our Annual BBQ in August 2014. We encourage everyone in the area to join us – we meet all over the Greater Chicago area. For more information, contact Kris Haskin at krishaskin@gmail.com or follow us on Facebook at Greater Chicago ΑΣΤ Alumnae. to test the wares: good stuff! A mix of “older” and “younger” alumnae made the outing fun and interesting. We wrapped up the summer with a chocolate party hosted by Kim Cottrell on September 11. Our group is energized by the young alumnae who have moved into the area. At the same time, we mourn the passing of Becky Venne Appleman and Susan Schirr Hargrove, both of the Alpha Alpha Chapter. Lowell The Lowell Alumnae Chapter has been quite busy with a number of events. During the holiday season, our chapter adopted a family with three children and two parents. An overwhelming amount of support was shown by our members, more than enough to buy all the things the family needed. As such, we hope to adopt two families this year. Our chapter held two meetings in the spring, plus a collegiatealumnae social in May, complete with trivia and an ice breaker. This year’s big push for Beta Tau was to welcome more alumnae to their Yellow Rose Semi-formal. Hoping to encourage alumnae attendance, the chapter added a silent auction table and lower ticket prices to their event. These changes significantly increased the alumnae presence, and the night was quite a success. During the summer our chapter held a BBQ. This year we invited our collegiate chapter to attend. Personal invitations were mailed out and the turnout was great. Alumnae were welcome to bring their children as well, and a wonderful Sunday afternoon was spent with sisters. Northern Virginia In April, we celebrated our 65th anniversary as an alumnae chapter at the Paradise Springs Winery in Clifton. Sisters and their families had a wonderful luncheon on the winery patio. Marie Stott was recognized as our Top Tau. We are looking forward to the events our executive board has planned for the coming year. We have welcomed three new sisters to the group. We meet once a month for lunch at a restaurant, usually in the Fairfax or Springfield areas. Our “Lunch Bunch” attendees are often sisters who cannot attend our evening meetings. We will be relying on social media to promote our events, so we encourage you to check out our Facebook page and follow us on Twitter at @ASTAlumnaeNOVA. Phoenix/Valley of the Sun The PVOS Alumnae Association held our Annual Meeting on April 20, 2013 at the home of Nicole Davis Turnquist, Epsilon Alpha, in Mesa, AZ. We enjoyed a lovely visit and potluck luncheon. Donations collected at the event were sent to Pine Mountain and Habitat for Humanity. In June, we gathered at Liberty Market Café in Gilbert for a farewell luncheon to honor Janet Hauke Larson, Zeta. She and her husband have moved to Everett, PA. On August 24, members and two guests enjoyed a wonderful meal at Stone and Vine in Scottsdale, and discussed plans for the upcoming months. Our next event will be a luncheon at Tempe Marketplace on September 28. We are proud of member Nicole Davis Turnquist, Epsilon Alpha, and her dedication to Alpha Sigma Tau. Nicole serves as Chapter Advisor for Epsilon Alpha and meets with them regularly at Embry Riddle in Prescott, AZ. During the year we’ve been happy to welcome three new members. We continue to have members who are active in the Salt River Alumnae Panhellenic Association, including Cynthia McCrory, Alpha Alpha, as treasurer, and Karen Anderson, Alpha Alpha, as secretary. Janet Larson has also maintained her membership in the Panhellenic Association. SOUTHEASTERN LOUISIANA November 9 in Hammond, Louisiana. Our theme for this year’s Relay is “The Relay BIG Cheese,” and sisters from our chapter will be selling grilled cheese sandwiches to help raise money for The American Cancer Society. Our team “Alpha Sigma Tau Alums,” led by Team Captain Kazanna Mancuso, Phi, has a fundraising goal of $1,000. Any donations to our team would be greatly appreciated and can be made online at www.RelayForLife.org/HammondLA; questions regarding Relay for Life can be directed to our Team Captain at kaz326@yahoo. com. In June, we installed our newly elected officers at our annual Officer Installation Banquet, held at Murphy’s Seafood in Hammond, Louisiana. The Chapter presented Beth Ebberman, Phi, with the 2013 Alumnae Top Tau Award for her dedicated service to the Sorority. It was a beautiful gathering, and congratulations again to Beth and all of our newly elected officers! This year, the Southeastern Louisiana Alumnae Chapter is launching a new “Alum Chum” program with the Phi chapter. Led by Danielle Woessner, Phi, the program pairs Phi chapter seniors with an alumna member prior to graduation. The “Alum Chums” then attend alumnae meetings, socials, and events together. Our goals for the program include showing the “Chums” the functions, operations, and culture of our alumnae chapter, encouraging new graduates to join an alumnae chapter, and strengthening the idea that you’re an Alpha Sigma Tau for life, not just four years. On September 15th, we held our first business meeting of the 2013-2014 year at the home of Rita Bertolino, Phi. A total of 22 sisters got together, wearing black and gold to cheer our Saints on to a victory after we took care of chapter business. It was the first of many gatherings we will have throughout this year. We are continually striving to fundraise for our scholarship. In March, sisters from our chapter helped raise scholarship money by selling grilled cheese sandwiches at Southeastern Louisiana University’s Rock N Roar event. Rita Bertolino also holds sorority themed raffles at our gatherings to help raise money for this great cause. Between and Rock N Roar and the raffles, we recently raised $475 for our scholarship. The Chapter is looking forward to celebrating Southeastern’s Homecoming in October, National Founders Day with the Phi Chapter in November, and a Holiday Party in December. If anyone in the Southeastern Louisiana area would like information on how to join to our chapter, please email Chapter President Esther Fontenot Barrios, Phi, at esther.fontenot@yahoo.com. The St. Louis Alumnae Chapter began the year with a New Year’s Luncheon at Bixby’s Restaurant, located on the upper level of the Missouri History Museum. In winter, the view high above the treetops in Forest Park is beautiful. Our cultural endeavors included two exhibits: the Civil War in Missouri and the Life of George Washington. We then celebrated the Chinese New Year with authentic Chinese cuisine crafted by Chef Tsu. Ride On St. Louis, an equestrian therapy ranch, and our local Habitat for Humanity received our financial support. We continue to support the national philanthropies, the St. Louis Alumnae Scholarship, and the Elizabeth Wilson/Dorothy Bennett Robinson Scholarship. An exciting close to the school year was the Grand Opening of the new wing of the St. Louis Art Museum. We took a guided tour of the new exhibits and learned about the new technology used to create a desirable climate for the art pieces. There was a large turnout for lunch in the new museum restaurant, Perspectives, which overlooks the grand basin from the 1904 World’s Fair and the iconic statue of St. Louis himself. It was a great season of sisterhood, culture, education, and sharing. Stars & Stripes The Stars and Stripes is an honorary alumnae association founded on the principle of “Always Someone There”. We meet virtually through our Facebook page and are always seeking alumnae who are current military members, previous military members, veterans, significant others, and family members. One of our goals is to help sisters stay connected, especially through the unique situations that those in military families may face. Our alumnae association completes several service projects, and our first campaign of the year set a new record. Members of Stars and Stripes gathered in Allentown, PA on September 28th for our annual Treats4Troops campaign. Led by Tracy Bond Ciabattoni, Zeta, we collect items to make fall and Halloween goody bags for our deployed service members. In this fifth year of the project, we created over 425 bags with the support of other collegiate and alumnae chapters. Three Alpha Sigma Tau husbands (a Soldier, an Airman and a Marine) will be among the deployed heroes receiving goody bags this year. We are excited to announce the sisters who have given birth in recent months and would like to extend our heartfelt congratulations to their families. Tiffany Rosin Basham, Beta Xi, Joan Schmidinger Nye, Beta Omega, Vanessa Smith Nolan, Delta Pi, and Joanne Rupprecht Walter, Psi, all recently welcomed precious little boys into their families. Alexzandra Montoya-Cipollone, Epsilon Eta, welcomed a beautiful little legacy. We would like to keep our sisters with loved ones currently deployed in our thoughts and prayers, and are looking forward to their safe return home. The Stars and Stripes alumnae will continue to be a group of sisters fulfilling the role of “Always Someone There” for our many deployed and soon-to-be deployed sisters and their family members. We would love for you, as a chapter or individual, to assist us in supporting them, too. You do not need to be a member of our group to do this (although we would love for you to join us!). For more information please contact vflorence@alphasigmatau.org, or seek us out on Facebook: Alpha Sigma Tau Stars & Stripes Alumnae Association. University, organized by Panhellenic President and fellow ΑΣΤ Rebekkah Bury. Several sisters attended the lunch, heard the words of the wonderful speaker, witnessed a fashion show and participated in a gift basket raffle. Laura Beth Stricker was not only a fashion show model, but also won ΑΣΤ’s own basket and two other prizes at the luncheon. We unanimously voted to nominate Joyce Jonak as our Top Tau for this year, and we mourn her passing. We unanimously voted to buy a brick in her memory, and chose a line from the Creed to be inscribed in her memory. Our May meeting was held at Lynnhaven United Methodist Church for a potluck dinner and new officer elections and inductions. Robbie Cool received a special gift as outgoing president. It was a bittersweet time as we said goodbye to Rebekkah Bury, who accepted a job in civil engineering in Chicago, IL. Our June social was held at the home of Joy Wotherspoon. Several sisters and their significant others attended. We enjoyed good food, laughter, memories, and participated in a fun scavenger hunt around the neighborhood. We continue to support our local and national charities: Habitat for Humanity, Pine Mountain, and the Citizens Committee to Protect the Elderly (CCPE). This winter we have been collecting food donations for the “Beach Bags” program that helps Virginia Beach high-school students with food on weekends. We also support the Victory Home men’s shelter in Portsmouth with toiletry donations. COLLEGIANS Zeta Lock Haven University of Pennsylvania, PA This fall, we will host our 30th annual Rock-A-Thon, a fundraiser benefiting Pine Mountain Settlement School and our local philanthropy, the Clinton County Women’s Center. The 24-hour event features members and guests rocking in rocking chairs and collecting money on the busiest corner of campus. We will have a DJ and lawn games to attract attention and more participation. Thrivent Financial for Lutherans has participated for the past five years and matched a portion of the funds raised. Since October is Domestic Violence Awareness Month, this is the perfect time to raise awareness of the Women’s Center. This is a great opportunity for our chapter have fun, and it is an excellent opportunity to show the campus and community that the members of the Zeta Chapterthe oldest sorority on campus and the oldest continuous ΑΣΤ chapterrecognize this as a great social responsibility. Omicron Concord University, WV The Omicron Chapter has just finished formal recruitment and postformal interest meetings. We picked up seven wonderful new members and could not be more excited about how well they display our core values. We are beginning to plan a trip to volunteer with Habitat for Humanity very soon and are also participating in the Conquer Chiari Walk Across America in Charleston, West Virginia, on September 21. We will walk under the Keegan’s Konquers team with one of the alumnae from the Gamma Mu Chapter. We are also participating in Homecoming, which has a Rumpelstiltskin theme this year. Phi Southeastern Louisiana University, LA The Phi Chapter is having a great semester. Recruitment could not have gone better. We have 33 outstanding new members, and now have more than 100 collegiate members. Our staff has done a great job planning social events, which include cup decorating, kickball, and “old school” themed socials. We have been busy preparing for Mocktails and Homecoming Week, two very big Greek events on our campus. We are selling shaved ice “snowballs” in the student union and donating the money to Pine Mountain Settlement School. For fundraising, we are holding Mr. Green and Gold, a men’s pageant. tremendous efforts to our chapter and ΑΣΤ as a whole. We are currently working on adopting new philanthropies in the community to give back to those who support not only our chapter but our beautiful campus as well. Psi James Madison University, VA We had a successful fall recruitment and were happy to invite 72 new members to join our sisterhood. So far, we have taken a trip to Camp Horizons for a fun retreat, where we played icebreaking games and ate s’mores around a campfire. In November, we will hold our annual Philanthropy Month, when we will raise funds and awareness for Habitat for Humanity; Pine Mountain Settlement School; our local philanthropy, the Juvenile Diabetes Research Foundation; and other local organizations. A 5K and various proceeds nights at local businesses are also planned. The Psi Chapter was fortunate to be selected to pilot ΑΣΤ’s new Four Year Member Development Program. Four of our sisters went to Indianapolis this summer to be trained on facilitating this new program. The sessions are meant to help sisters discover and discuss new ways to improve the chapter. The entire chapter will return to Camp Horizons for a sisterhood retreat. Other sisterhood events planned include apple picking and a DIY craft night. Zeta Tau Longwood University, VA In spring semester, we raised more than $1,450 for the Cystic Fibrosis Foundation through our annual weeklong Rock-A-Thon event. During this week, at least four sisters were out on campus from 9:00 a.m. to 9:00 p.m. daily, collecting money and spreading awareness. We plan to continue our support for the Cystic Fibrosis Foundation through a walk to be held later this semester on campus to raise funds and bring the community together for a great cause. Many of our sisters participated in Relay for Life in April, and we gave nearly $1,900 to the American Cancer Society. We started off our fall semester celebrating convocation, a Longwood tradition in which underclassmen decorate seniors’ graduation caps. We had a lot of fun making and seeing all of the crazy Alpha Sigma Tau caps and celebrating the many accomplishments of our seniors. We continue to hold open houses and recruitment events in preparation for formal recruitment in the spring. Alpha Epsilon Western Illinois University, IL We welcomed 20 new members in the fall semester and six in the spring semester. We are always very excited for our alumnae and family weekends. At our annual alumnae weekend in March and family weekend in April, we had a cookout, open house and Sunday brunch. We conducted a silent auction at dinner to help raise money for our chapter. This was a fun way for the ΑΣΤ families to get involved! Alpha Lambda Radford University, VA Over the summer, eight sisters attended Officer Academy and Recruitment Boot Camp. They learned about a variety of valuable life skills, such as leadership and social skills, and have been sharing what they learned with the rest of the chapter. Recruitment Boot Camp taught us many tactics and skills to improve our overall recruitment. The fall semester started off strong as we hosted the second annual Girls’ Night In event, where we welcomed Radford University students to spend some time with us while enjoying fun activities, crafts and refreshments. We welcomed nineteen values-based women on Bid Day. This brings the Alpha Lambda Chapter membership to a total of 78! The sisters of Alpha Lambda are active not only on campus, but also outside of Radford University. Twelve sisters took a road trip on September 6 to visit Pine Mountain Settlement School. We have also been working hard to fundraise for the chapter by working at the Virginia Tech football games in Blacksburg, Virginia. This fall, we hosted the inaugural Alpha Male competition October 18–24, a competition among the fraternities on campus, with all proceeds going to Pine Mountain Settlement School. We are also proud to have four sisters on the Panhellenic Council. Alpha Phi West Chester University of Pennsylvania, PA We are excited to welcome a new group of women and hope to help them flourish with the passion and enlightenment that Alpha Sigma Tau brings to each of us. Over the past year we have been more involved within the community. We hit the streets of West Chester for monthly block cleanups and held a volleyball tournament with Sigma Alpha Epsilon to benefit Camp Dream Catcher. The DJ, prizes, and immense support made it a wonderful experience. During spring semester, our chapter held a fashion show and pet rescue at the local nursing home. We helped the residents down to the main room to pet the rescued animals and watch the fashion show. Seeing the smiles on the residents’ faces made it an experience to remember. We hope to visit the residents again soon as many of us formed a connection with them. We are proud to say that Alpha Sigma Tau received second place overall in the Greek games last spring. Beta Delta Duquesne University, PA Spring 2013 was arguably one of the greatest semesters the Beta Delta Chapter has ever seen! We breezed through recruitment, taking on a new member class of 35 exceptional women—the largest new member class of any Greek chapter on campus. Our largest philanthropy event, the ninth annual Miss Duquesne Pageant, was held in March. With contestants from several student organizations, we raised more than $8,000, which was split between Habitat for Humanity and the Make-AWish Foundation, our local philanthropy. We also sponsored Duquesne’s first annual Earth Week. To cap off the semester, we were awarded Outstanding Sorority Recruitment and New Member Program, Best Risk Management Program, and Sorority Chapter President of the Year (Emalea Helisek). Beta Eta Southern Illinois University Edwardsville, IL We took a new member class of seven new members and participated in many philanthropic events on the SIUE campus. In February, the chapter was asked to volunteer at the Athletics Department’s Pink Zone event, a basketball game dedicated to raising breast cancer awareness and donating all proceeds to the St. Louis affiliate of Susan G. Komen Breast Cancer Foundation. We participated in SIUE’s first annual Dance Marathon, helping to raise more than $10,000 for the Children’s Miracle Network. In April the chapter participated in SIUE’s Relay for Life and hosted our annual Trivia Night. Family members, friends, and classmates came out to participate in a night full of fun and games, breaking the previous attendance record. We sold food, drinks, and raffle tickets and put together gift baskets for a silent auction, raising $6,000! sisters from around the country, interacting with the National Council and Headquarters staff, setting goals for our chapter, and developing strategies to help our chapter grow in membership and become better leaders. Additionally, one sister participated in Alpha Sigma Tau’s Service Immersion Project in Hawaii. Her experience making a difference through service while learning about leadership traits was life changing. This fall semester started off with a bang with our participation in Homecoming. The chapter won the women’s division for the third year in a row and, even more exciting, beat out all divisions for the Overall Champion title! Beta Pi Eastern Illinois University, IL We have had a year full of accomplishments. Sisters developed their leadership skills not only within Alpha Sigma Tau, but across our entire campus. We are represented in the leadership of more than 80 registered student organizations. Within our sisterhood, you can find the student body president, editor-in-chief of the campus yearbook, EIU cheerleading captain, and numerous presidents and executive members of student organizations. Our chapter has impacted our campus community as well as the local community. We devoted our time to more than 1,500 community service hours during the past year, and we are currently working on more projects. We have hosted philanthropic events such as World Series, a softball tournament, and Tau Trivia, a pop culture trivia tournament; participated in Relay for Life; and assisted in numerous community service opportunities. We have really grown as a chapter! We come together for a least one sisterhood event a week to get to know the new members and help them through the process of becoming an Alpha Sigma Tau. bursting into fits of laughter. However, it is this quality that encourages attendance and sets the atmosphere for addressing such issues in an optimistic manner. Through this event, we raise awareness and remind people of a serious and prevalent issue in our society. Most of all, we promote the concept of looking out for one another, as sisters always do. Beta Mu Salisbury University, MD To make a larger name for ourselves on campus, Beta Mu took the initiative to promote “going green.” We participate in “meatless Mondays” and spread the word through various social media outlets. At each chapter meeting we collect our spare change to help provide clean water for UNICEF. Last September, we took part in the three-mile walk to defeat ALS (Lou Gehrig’s disease). For our local philanthropy, we participated in the PJ Aldridge Foundation three-mile walk/run to support the fight against lung cancer. Last spring, we welcomed 32 new members, who were excited to take part in our efforts to promote environmentally friendly activities throughout campus. To strengthen our relationship with our local philanthropy, the PJ Aldridge Foundation, we held a weeklong event raising $714. Another important event was the Multiple Sclerosis Walk in Ocean City, Maryland. We showed great numbers at this event for the second year in a row. The MS Walk holds a dear place in our hearts since two of our alumnae are battling the disease. To end this rewarding school year, we were named the top team at our annual Relay for Life, with the most active participants. Beta Nu Bloomsburg University of Pennsylvania, PA The sisters of the Beta Nu Chapter could not be happier about kicking off the fall semester. Working at the Little League World Series in Williamsport, Pennsylvania, for the second summer in a row, we raised about $7,000 for the chapter. We are proud to have one of the largest new member classes during recruitment this semester. Many community service projects are underway: Bocce Bash (a Special Olympics event), a breast cancer walk, and the local Color Run to raise money for cancer research. Gamma Zeta Frostburg State University, MD Many sisters helped welcome the new freshman class by ushering at freshman convocation, scooping ice cream at a campus social, and speaking to freshman classes about Greek life. We are hosting a blood drive with another Greek organization on campus this semester, as well as co-hosting a sexual assault awareness forum. Along with participating in Wreaths Across America in Arlington, Virginia, we will raise money for supporting the troops, breast cancer awareness, and of course Pine Mountain Settlement School and Habitat for Humanity. Last semester Lauren Schoelen was honored with the Pillar of Community Achievement award and Andie Gambrel was named Greek Goddess at our annual Greek Week. We also tied for first place in fundraising at Frostburg, as well as coming in second place for most total philanthropy hours by an organization. Gamma Lambda Kutztown University of Pennsylvania, PA Last semester we held our annual philanthropy event, Mr. Kutztown, a male pageant. All of the profits were donated to Habitat for Humanity and other local philanthropies. For Mr. Kutztown, members from different Alpha Sigma Tau chapters joined us as we watched men from different sports teams, fraternities, and clubs prove to us why they should be Mr. KU. In the spring, we welcomed five new women, bringing us to 60 members! For this fall, we have decided to try something new. Instead of a single local philanthropy, each month we want to help a different organization that one of our sisters is involved in or affected by (such as the Humane Society, Make-a-Wish Foundation, ALS awareness, etc.). During fall recruitment, we gained 17 new members, making the chapter the largest it has ever been. This fall, our sisters will walk together in the Alzheimer’s walk around Kutztown, with all donations going toward fighting Alzheimer’s disease. Gamma Rho Seton Hall University, NJ We hosted our first “Rock-A-Thon” benefit concert last spring to raise money for Pine Mountain Settlement School. We gathered several local bands and singers to perform for students and raised $740 for our philanthropy. We also participated in Greek Week and our sister Christine Byrne won Greek Goddess. Although we didn’t win overall, our chapter walked away with two awards: Best College Panhellenic Council (CPC) Organization and Highest CPC GPA. During the semester, we also won Greek Organization of the Year. Two sisters, Kimberly Topel and Madelyn Abdalla, were inducted into the Order of Omega Greek Leadership Honor Society. We started the fall semester by helping an alumnae sister, Kristen Manga Akian, raise money for her son Avedis “Avi” Akian, who has ataxia telangiectasia (A-T, or LouisBar syndrome), in an event called Ride 4 Avi. The money raised will go toward helping to find a cure and allowing Avi to live his dreams. We also participated in Hazing Prevention Week by hosting a discussion panel and co-sponsoring other hazing prevention events throughout the week. Last spring we held our annual philanthropic Love Struck event, raising more than $1,000 for Relay for Life and Habitat for Humanity. Over the summer we helped rebuild homes in New Jersey shore areas affected by Hurricane Sandy. This semester we had our annual Suicide Awareness Week, where we sold yellow ribbons, had a bake sale, and informed students about suicide prevention. We also hope to help with the Big Event, which will help us get involved with local towns by participating in community service. Another event we will host will be called “Are You Smarter Than a Fraternity Guy?” The proceeds will be donated to the Ashley Lauren Foundation, which helps children with cancer. We look forward to participating in Greek Week in the spring; we won first place last spring. recruitment events on our chapter calendar, as well as fundraisers for Pine Mountain Settlement School and Convention. This fall, we volunteered at the Conquer Chiari Walk Across America in Charleston, West Virginia, in honor of our sister Lori Shaffer’s daughter. We helped to raise money and awareness of Chiari malformation. We plan to continue our work with the U.S. Marine Corps Toys for Tots Foundation by helping WVU Institute of Technology exceed their donations from last year. In addition, many of us will participate in the Jingle Bell Walk/ Run for Arthritis in Charleston in honor of a fellow student. Gamma Upsilon California State University, Los Angeles, CA The ladies of Gamma Upsilon Chapter hosted a Valentine’s Day fundraiser to raise money for Hurricane Sandy victims and for Sydney, a nine-year-old leukemia patient. We crafted and sold Valentine-grams that included a bouquet of Hershey’s Kiss “roses” and a teddy bear. We started this fundraiser in winter 2012 and it has been a big success. This year we raised over $1,000. Throughout winter quarter, sisters played volleyball and basketball in Greek intramurals. After a tough season, we finished the quarter strong and undefeated in volleyball, bringing home a well-earned trophy. We spent spring break at a beach camping retreat in San Clemente, digging our toes in the sand and basking in the sun. As spring quarter came to an end, we welcomed 10 new sisters into our chapter. COLLEGIANS DELTA DELTA $4,000. Thanks to the great planning efforts of our Collegiate–Alumnae Director, Stacey Thomas, we are planning numerous events to get to know our alumnae better. The next few months hold an apple-picking event, a rededication ceremony, and a potluck dinner. Finally, we are pleased that we are second-time champions of the Greek Week events that take place in the spring! We are the first sorority on campus to make it onto the Greek Week trophy, and we are holding on tight to our title. We hope to do it again this spring! Delta Alpha Gannon University, PA We started the year rejuvenated and ready to accomplish great things. Most recently, we sponsored a youth soccer team of first- and secondgraders from Carnegie, Pennsylvania, the hometown of one of our sisters. It is important to us to show our home communities the positive impact Alpha Sigma Tau has had on our lives. We plan to cheer them on at one of their fall games, and are making signs and snacks for them to show our support. Locally, we have had many volunteer opportunities to kick off the semester. Some of our sisters helped out at Presque Isle’s Half Marathon, where one of our alumnae was running. We also participated in Gannon’s Invitation to Volunteer Everywhere (GIVE) Day. Some sisters helped out at the Erie Zoo, others weeded gardens, and many wrote letters to eighth-graders to inspire them to stay in school. Additionally, we have kept busy with events like “Fall in Love with Alpha Sigma Tau” and a game night with paint twister— an activity we highly recommend! Fall recruitment has brought in enthusiastic new sisters. new member class. We have adopted Uhlich Children’s Advantage Network (UCAN), an organization that fights gun violence in Chicago, as our local philanthropy. We invited other campus organizations to help us make bracelets consisting of 26 beads (one for each victim of the tragic Sandy Hook shooting) and sold them in UIC’s student center for $5, with all proceeds going to UCAN. We teamed up with Theta Xi Fraternity for a date auction to benefit Habitat for Humanity. The event was a huge success, raising a total of $1,500. Together with the men of Tau Kappa Epsilon and Kappa Alpha Psi, we won UIC’s annual Greek Week Championship Games. Greek Week is a weeklong competition of sports games, the annual Knowledge Bowl trivia competition, and other campus unity events. Also during Greek Week, our president, Nicole Sammartino won Collegiate Panhellenic Council President of the Year. In addition, we ranked first in completed service hours out of all the organizations at UIC. Delta Pi Oglethorpe University, GA Our spring philanthropy event, A Very Southern Picnic with the Taus, was a huge success. The money we raised went to our local philanthropy, the Atlanta branch of Habitat for Humanity. Even though we had a few obstacles along the way to fall recruitment (our sorority house flooded! ), we had a lovely Lilly Pulitzer–themed recruitment. On bid day, we had the privilege of welcoming 11 new members into our chapter. Delta Sigma University of the Sciences, PA Our sister Abby Hoffer was chosen Greek Woman of the Year and our chapter took home the award for Greek of the Year. We added 15 new members to our group. We are confident they have what it takes to keep ΑΣΤ strong at the University of the Sciences! This summer we assembled in Ocean City, New Jersey, for our annual Anchor Splash weekend retreat. Throughout the weekend, we held meetings to reflect on our strengths and improve on our weaknesses. We also discussed recruitment strategies and chapter goals for the coming school year. There are numerous events this semester that we are all excited about. A day cruise in the area is being organized as an opportunity to reunite with alumnae. During the fall, it is a tradition for us to participate in the Leukemia & Lymphoma Society’s Light the Night Walk. Last year we raised almost $2,000. We continue to collect can tabs for Ronald McDonald House, which uses the donations to support families. Delta Tau Oakland University, MI We nearly doubled our chapter size for the second year in a row. This is the first year we met quota, and we are now three members from total. We extended bids to 28 women, bringing our chapter size to 58 members. This year we will continue our annual philanthropy of Focus Hope with the Detroit alumnae chapter. Focus Hope is “an organization dedicated to intelligent and practical solutions to … hunger, economic disparity, inadequate education, and racial divisiveness” (www. focushope.edu). This past year we packaged more than 1,300 boxes of food for the homeless. Aside from Focus Hope, we will work with our local philanthropy, Haven, a domestic violence shelter for women, for Make A Difference Day, a day of service sponsored by our school. Delta Phi New York University, NY We used Relay for Life as our vehicle for both fun and philanthropy. Our new members enjoyed the organization (and success!) of a bake sale with proceeds going to Relay for Life. Later in the semester, the chapter collaborated at Relay for Life’s main event by hosting a booth and contributing to NYU’s collective funds for donation. We are proud to announce we placed third overall in Greek Games, an inter-Greek competition here at NYU. celebrate our advisor Jenn Marshall’s 20th year of being a member of Alpha Sigma Tau. Delta Omega Penn State Altoona, PA We welcomed 15 new members who hail from Alaska to Hawaii and everywhere in between. After our rejuvenating bonding in nature at a gorgeous nearby lake, we will be eager to carry out campus events such as Breast Cancer Week. Our annual Date Auction will be the week’s final event. All of the proceeds collected are donated to Pine Mountain Settlement School and research to fight breast cancer. With the other Greek organizations on campus, we help out the local Mountain Lion Backpacks organization, which provides schoolchildren with backpacks full of nutritious foods to encourage their focus on learning. We also help raise funds for Penn State’s noted Dance Marathon (THON), the largest student-run charity in the world. THON provides moral support and funding for unpaid medical bills for local children suffering from cancer. of garments from formal wear to bikinis, on which they are judged. Another philanthropy in which we are involved every year is the Relay for Life on campus. At this event we sell crafts and walk to raise money for cancer during a 24-hour period. We were excited to work with Tau Kappa Epsilon Fraternity during an educational forum on sexism. With the start of a Greek Council on campus during the 2013–14 academic year, we have upcoming events that involve all the fraternities and sororities. These include educational forums, campus ministries, basketball, and a service project. Epsilon Beta The University of Texas–Pan American, TX Last spring, we hosted the ninth annual Mr. ΑΣΤ, our main philanthropic event, which features a male beauty pageant. Male students across campus support our cause by participating and we take a lot of pride in this event. This spring we raised more than $800! We kicked off the fall semester with nonstop preparations for recruitment, including our own recruitment boot camp.. Our hard work paid off as we welcomed 25 new members, doubling our chapter size! This semester, we will participate in National Latino AIDS Awareness Week in October and Diabetes Awareness Week in November to bring awareness and educate the community on these very important topics. We are planning a 5K run on campus, where participants who bring in canned food will help the community during Thanksgiving. Planning is also under way for our end-of-the-year Yellow Rose banquet with a Great Gatsby theme. Epsilon Lambda Indiana University South Bend, IN Last semester, we helped our local Habitat for Humanity, as we do every semester. This time we helped insulate the house and put shingles on a roof. It was cold and raining but, as always, it was a good time helping others in need. We also participated in the American Cancer Society’s Relay for Life, another annual tradition. We wore yellow ribbons for a sister who is a survivor of bone cancer. We organized our first kickball game with Theta Phi Alpha, which was a blast! We also began forming a campus Panhellenic Council, which has been very exciting. We worked hard on academics this past semester and it paid off. We ended up with a chapter GPA of 3.2, beating the campus all-women GPA of 3.0! We applied to attend Recruitment Boot Camp and to be a pilot chapter for the Membership Development Program and we were accepted for both. Over the summer we had six members representing us at Officer Academy, Recruitment Boot Camp, and Mastering Facilitation in Indianapolis. public could buy treats and play with the puppies for a donation, which went to Pine Mountain Settlement School. Outside of our chapter, we participated in other Greek philanthropies such as Gamma Phi Beta’s Lip Sync, Greek Week, Kappa Alpha Order’s Southern Belle (where one of our own was crowned), Lambda Chi Alpha’s Pumpkin Bust, Phi Delta Theta’s Buy a Phi, and many more. This month we participated in our first formal recruitment. Starting with only 42 women, we more than doubled our size with an additional 46 new members. Seeing their excitement to join our sisterhood was icing on the cake for a successful first recruitment. All Nighter. There was a group of sisters who skipped naps and worked straight through the night. At 8:00 AM, when we were finally done with statue, we stood at the end of the driveway and watched the sun rise while singing “ah zabenya” from The Lion King. A few hours later we saw the “First Place” sign in our front yard, making the last month of cold days and sleepless nights totally worth it!” Other Winter Carnival events include the human dogsled race, snow volleyball, snow tug-o-war, ice bowling, a beards competition, comedy skits, ice fishing, curling, broomball, and a queen’s competition. When asked about her favorite Winter Carnival event, Kelly Garringer says, “Tug-o-war and human dogsled are my favorite! I like the teamwork aspect of it because without all of the sisters helping, we wouldn’t be successful in the competition. We have to work together!” Winter Carnival provides an opportunity for the sisters of Beta Xi chapter to demonstrate the values of ΑΣΤ by their participation, dedication, and excellence during the festival. Like the Alpha Sigma Tau sisterhood, Michigan Tech’s Winter Carnival is unforgettable and one of a kind. Bressler, Alpha Tau, Associate Director of Chapter Services; Gretchen Stahl, Director of Membership Growth; Erica Richards, Beta Mu, Educational Consultant; and other supportive area alumnae. Twentyeight women were initiated. We are excited about being part of a large network of members throughout the United States. It gives us great pleasure knowing that we have sisters who share the same diversity, principles, and ideals of sisterhood. NOW TRENDING While on her way to the Dave Matthews Band concert in Hershey, Pennsyvania, Emily Kraus, Zeta, never thought she’d be giving Dave himself a ride there. Emily happened to see the singer stranded on the side of the road with a popped bicycle tire and gave him a lift! We want to see your #TauLove! Send us your Homecoming and Founders Day photos at communications@alphasigmatau.org! torn communities, and broken hearts all around. It really stirred up emotion in the students at the event. Following the video, a student who barely survived an accident that was a result of drunk driving spoke to the students about the experience, leaving a strong impression on all involved. Although it wasn’t in the light-hearted mood of the rest of the night, this was definitely one of the high points-the room was filled with tears and shocked faces. It reminded us all that while the event was supposed to be fun, the message we were sending was one that was a lot more important than a game of water pong. The event was a huge success, attracting the support of other Greek organizations on campus and the attention of many students across campus. The school enjoyed it so much that they asked us to make it an annual event, and we are happy to oblige. The event was a lot of fun and a lot of hard work to organize. Freshman sister Missy Tirone called the event “eye-opening” and truly “fun without the hangover”. At the end of the night, we knew that as a chapter, we had come together to do something bigger, and that we really made a difference to the students who attended Fun Without the Hangover. It brought us closer as sisters, created a tradition that will be upheld for years to come, and hopefully helped to positively affect the lives of Armstrong’s students. #ASTATL Registration Rates Collegiate Chapters - $1,600 entitles each chapter to •	1 Convention Delegate •	1 Convention Alternate Delegate •	1 Chapter Advisory Board Delegate Additional Collegians - $350 each Alumnae/Non-member Advisors - $450 Guest meal packages, day rates, and Yellow Rose Banquet tickets are available. Lodging Room rates: $125 per night, plus tax (roughly 16%) Attendees should reserve their room with the Alpha Sigma Tau room block. Arrival and Departure Tentative Scheduled Start Time: Thursday, June 26 – 1:00 pm Opening Ceremony Rehearsal Thursday, June 26 – 2:00 pm Opening Session Begins Departure: Sunday, June 29 – time varies Specific pricing, hotel information, registration, and additional information available at www.alphasigmatau. org/convention.